These days, taking your whole family to see a movie will make a serious dent in your wallet. Ticket prices have risen tremendously and refreshments are overpriced. What's more advanced media and sound technology such as Blu-ray and surround sound gives a quality viewing experience all in the comfort of your living room. Consequently, more and more people are investing in their own theatre/home entertainment system. 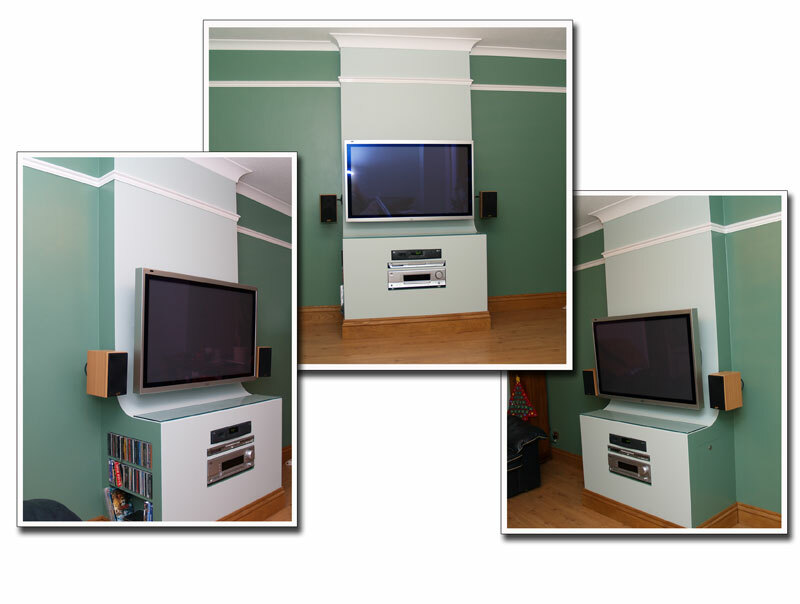 Furniture to fit can create the perfect home for your LCD/plasma TV or media system. We can design and build TV cabinets with DVD and video storage, TV stands, wall-mounted media units to maximise floor space, Home Entertainment Centres and Audio Racks in made-to-measure sizes and styles to suit your home. Solution: An MDF structure to house all equipment and provide media storage. Finish: Painted to match the room.